Journey through China's history with Susan Barker's dreamlike novel. Described by The Independent as "China's Midnight's Children" Susan Barker's novel takes us through China's past and present as while all along, someone has been watching over Wang and waiting for him. 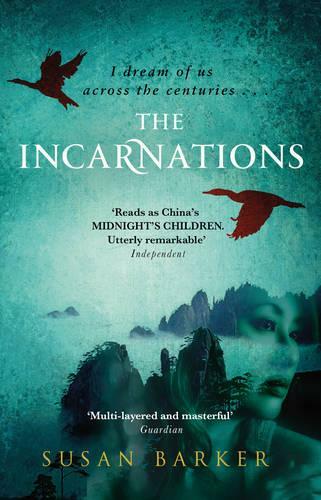 Written with a dreamlike, almost hallucinatory at times, quality, The Incarnations draws you in on a journey across a millennium. Touching on betrayal and obsession, it grabs hold of you and refuses to let go. Read the opening pages below and prepare to be hooked. I dream of teenage girls, parading the Ox Demons and Snake Ghosts around the running tracks behind our school. I dream of the tall dunce hats on our former teachers’ ink-smeared heads, the placards around their necks.Down with Headteacher Yang! Down with Black Gangster Zhao! I dream of Teacher Wu obeying our orders to slap Headteacher Yang, to the riotous cheers of the mob. I dream of the sickly Emperor Jiajing, snorting white powdery aphrodisiacs up his nostrils, and hovering over you on the four-poster bed with an erection smeared with verdigris. I dream of His Majesty urging us to ‘operate’ on each other with surgical blades lined up in a velvet case. I dream of sixteen palace ladies gathered in the Pavilion of Melancholy Clouds, plotting the ways and means to murder one of the worst emperors ever to reign. I watch you most days. I go to the Maizidian housing compound where you live and watch you. Yesterday I saw you by the bins, talking to Old Pang the recycling collector, the cart attached to his Flying Pigeon loaded with plastic bottles, scavenged to exchange for a few fen at the recycling bank. Old Pang grumbled about the cold weather and the flare-up in his arthritis that prevents him reaching the bottom of the bins. So you rolled up your coat sleeve and offered to help. Elbow-deep you groped, fearless of broken glass, soapy tangles of plughole hair and congealed leftovers scraped from plates. You dug up a wedge of styrofoam. ‘Can you sell this?’ you asked. Old Pang turned the styrofoam over in his hands, then secured it to his cart with a hook-ended rope. He thanked you, climbed on his Flying Pigeon and pedalled away. After Old Pang’s departure you stood by your green and yellow Citroën, reluctant to get back to work. You stared at the grey sky and the high-rises of glass and steel surrounding your housing compound. The December wind swept your hair and rattled your skeleton through your thin coat. The wind eddied and corkscrewed and whistled through its teeth at you. You had no sense of me watching you at all. Zhongguancun Road, nearly there. Thirty minutes over in a heartbeat. Your phone vibrated and you held it to your ear. Your wife.Yes, hmmm, yes, seven o’clock. Yida is a practical woman. A thrifty, efficient homemaker who cooks for you, nurtures you and provides warmth beside you in bed at night. I can tell that she fulfils the needs of the flesh, this pretty wife of yours. But what about the needs of the spirit? Surely you ache for what she lacks? Beijing, 2008, the Olympics are coming, but as taxi driver Wang circles the city's congested streets, he feels barely alive. His daily grind is suddenly interrupted when he finds a letter in the sunshade of his cab. Someone is watching him. Someone who claims to be his soulmate and to have known him for over a thousand years.